Credit:left, G. Scharmer, L. Rouppe van der Voort (KVA ) et al., SVST: right, copyright 2001, Reel EFX. Inc.
As Fred Hoyle long ago pointed out; the Sun does not conform to the expected behavior of an internally heated ball of gas, simply radiating its energy into space. Instead, its behavior at every level is complex and baffling. Nowhere is it more mysterious than in a sunspot. Sunspots are strange blemishes on the face of the Sun that offer some of the strongest evidence against the Sun being powered internally. They are conventionally described as being a result of strong magnetic fields pinching off the convection of heat from inside the Sun before it can reach the surface. The electric star interpretation is that sunspots are breaks in the hot surface of the sun, through which we can get a glimpse of the underlying layers. To satisfy the standard theory, these deeper layers of the Sun should be hotter to drive the so-called vigorous convection. But they aren't. The dark center of the sunspot, or umbra, is 20% cooler than the rest of the surface of the Sun. The outer shadow of the sunspot, or penumbra, and the structure and behavior of the filaments that form the penumbra are also too complex to be explained by standard stellar theory. However, there is another familiar form of atmospheric electric discharge that does scale appropriately and could explain the mysterious dark cores of penumbral filaments. It is the tornado! Tornadoes last for minutes and can have a diameter of the order of one kilometer. Scale those figures up 100 times and we match penumbral filaments very well. 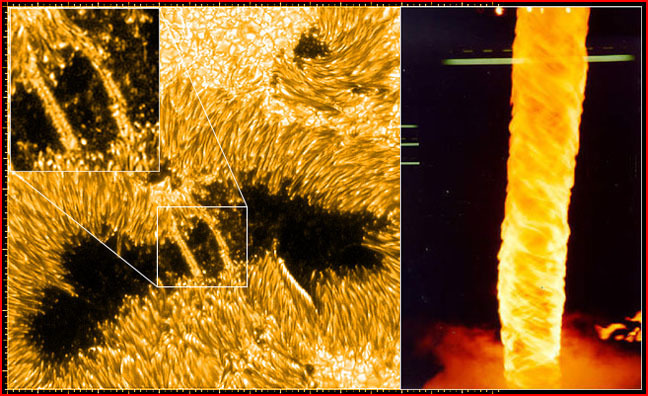 And if the circulating cylinder of plasma is radiating heat and light, as we see on the Sun, then the solar "tornado" will appear, side on, to have bright edges and a dark core (right image, above).